0068 Death: The Roman Emperor Nero, by suicide at 32 years of age, after the Senate declares him a public enemy. 1456 23rd recorded perihelion passage of Halley's Comet. 1534 French navigator Jacques Cartier becomes the first European explorer to discover the St. Lawrence River in present-day Quebec, Canada. "The King of France, François I, chose French explorer Jacques Cartier to find "certaines îles et pays où l'on dit qu'il se doit trouver grande quantité d'or et autres riches choses" ("certain islands and lands where it is said there are great quantities of gold and other riches"). In 1534 he set sail looking for a western passage to Asia. He explored parts of what are now Newfoundland (starting on May 10 of that year) and the Canadian Maritimes and where he learned of a river further west (the St. Lawrence River) that he believed might be the much searched-for northwest passage. He landed for the first time at present day Gaspé, Quebec where he planted a cross and claimed the territory for France. He then sailed up to Québec City, then called Stadacona. During this trip he kidnapped Chief Donnacona's two sons, Domagaya and Taignoagny and took them back to Europe. Cartier set sail for a second voyage on May 19 of the following year with 3 ships, 110 men, and the abducted boys (who were returned to the chief). He sailed upriver to the Huron village of Stadacona and Iroquois Hochelaga (Montreal) and arrived on October 2, 1535. He heard of a country further north, called Saguenay, that was said to be full of gold and other treasures. On May 23, 1541 he departed Saint-Malo on his third voyage. This time he was looking for Saguenay; however, he again did not get further than Hochelaga. After a fierce winter spent in Canada, he returned to France the next year. A large part of the sailors died of scurvy when the ship got stuck in the ice without proper food. Cartier had to ask the natives for local traditional medicine, which they gave. Cartier spent the rest of his life in Saint-Malo and his nearby estate, and died in 1557. He died before any permanent settlements were made in the area; that had to wait for Samuel de Champlain in 1608." 1549 The Church of England adopts The Book of Common Prayer, compiled by Thomas Cranmer. 1672 Birth: Piotr Alekseevich Romanov, AKA Peter the Great, Russian Czar. 1785 Birth: Sylvanus Thayer, military engineer and educator, an early superintendant of the United States Military Academy at West Point and an early advocate of engineering education in the United States. Thayer was born in Braintree, Massachusetts, the son of farmer Nathaniel Thayer and his wife Dorcas. In 1799 at the age of 14, Thayer was sent to live with his uncle Azariah Faxon and attend school in Washington, New Hampshire. There he met General Benjamin Pierce, who, like Faxon, was a veteran of the Revolutionary War. In 1803 Thayer matriculated at Dartmouth College, graduating in 1807 as valedictorian of his class. Thayer, however, never gave the valedictory address at Dartmouth, having been granted an appointment to West Point by President James Madison at the behest of General Pierce. Thayer graduated from the Military Academy in a single year, and received his commission as a second lieutenant in 1808. During the War of 1812, Thayer directed the fortification and defense of Norfolk, Virginia and was promoted to major. In 1815, Thayer was provided $5,000 to travel to Europe, where he studied for two years at the French École Polytechnique. In 1817, President James Monroe ordered Thayer to West Point to become superintendant of the Military Academy. Under his stewardship, the Academy became the nation's first college of engineering. Colonel Thayer's time at West Point ended with his resignation in 1833, after a disagreement with President Andrew Jackson. Thayer returned to active duty in the Army Corps of Engineers. He retired in 1863 with the rank of brigadier general. In 1867, Thayer donated $30,000 to the trustees of Dartmouth College to create the Thayer School of Engineering. Thayer personally located and recommended USMA graduate Lieutenant Robert Fletcher to Dartmouth president Asa Smith. Fletcher became the school's first--then only--professor and dean. The Thayer School admitted its first three students to a graduate program in 1871. Sylvanus Thayer died on September 7, 1872 at his home in Braintree. He was reinterred at West Point in 1877. 1781 Birth: George Stephenson, British engineer whose inventions helped create the British railroad system. In 1814, while working as chief mechanic at a coal mine in Killingworth, near Newcastle, he completed his first locomotive. This locomotive, Blucher, could pull eight coal cars at 4 miles (6 kilometers) per hour. Stephenson helped his son, Robert, build the Rocket, a locomotive that became the model for almost all later steam locomotives. He also created such useful inventions as a miner's lamp and an alarm clock. In addition, Stephenson sponsored schools and libraries for miners and their children. Stephenson built the world's first public railroad, the Stockton and Darlington, which opened in 1825. He then began the complicated task of building the Liverpool and Manchester Railway, using his ideas for tunnels, grading, and bridges to make a level roadbed." 1800 In Napoleon Bonaparte's Italian campaign, the first Battle of Montebello is fought and French forces defeat the Austrians. 1815 The Congress of Vienna closes with the signing of the Final Act. Among its provisions; Belgium and Luxembourg unite with Holland to form the Netherlands, Switzerland is declared a neutral power, East Poland cedes to Russia and its western provinces to Prussia. Changes also affect Italy, Spain and Portugal. 1863 US Civil War: The largest cavalry battle of the war is fought at Brandy Station, Virginia. After the Confederate victory at Chancellorville in early May, Lee began to prepare for another invasion of the North by placing General J.E.B. Stuart's cavalry at Brandy Station, just east of Culpeper, to screen the rest of the Army of Northern Virginia as it started toward the Blue Ridge Mountains. Stuart used this time at Brandy Station to stage a grand parade in order to boost morale and show off his dashing troopers to local residents. Unbeknownst to Stuart, his pompous display was observed by uninvited Union cavalry and infantry under the command of General Alfred Pleasonton, who lurked across the Rappahannock. On this day, Pleasonton strikes the surprised Rebels in a two-pronged assault. After initially falling back, the Confederates will eventually rally, and the battle rages all day around St. James Church. The battle's key moment comes when Union troops seize Fleetwood Hill, an elevation from which the Yankees can shell the entire battlefield. Confederate Lieutenant John Carter struggles to mount a cannon on the hill and fires a single shot that stops the Union troopers in their tracks. The Yankee officer leading the charge suspects that the Confederates have a line of guns sitting just over the top of the hill, when in fact it is a single gun with barely enough powder for a single shot. Carter's heroic act saves the day for Stuart. The move buys time for the Confederates, and they hold the hill. The battle continues until late afternoon, with many spectacular cavalry charges and saber fights in addition to hand-to-hand combat by dismounted cavalry. In the end, Stuart's forces continue to hold the field. Although it is technically a Rebel victory, the battle demonstrates how far the Union cavalry has come since the beginning of the war. Stuart's cavalry had been the master of their Union counterparts, but its invincibility is shattered on this muggy Virginia day. 1870 Death: Charles Dickens, author, in Gad's Hill Place, near Rochester, Kent, after suffering a brain hemorrhage the previous evening. 1893 The Ford Theatre collapses in Washington, DC, killing twenty-two people. Note: This is the same ill-fated entertainment venue where John Wilkes Booth assassinated President Lincoln 28 years earlier. 1898 An agreement is signed under which Hong Kong is leased to Britain from China for a period of 99 years. The territory will be returned to Chinese rule in 1997. 1908 King Edward VII of Britain meets Tsar Nicholas II of Russia on board the Royal Yacht anchored in the Baltic; the first meeting between a tsar and a British monarch. 1915 Birth: Les Paul, in Waukesha, Wisconsin, Grammy Award-winning guitarist, pioneering recording engineer, inventor; the Les Paul electric guitar. 1915 WW1: Wilson sends the second Lusitania note to the Germans, demanding an end to their procrastination over reparations for sinking the unarmed passenger ship. Wilson refuses to recognize the previously nonexistent "war zone" set up by Germany around the British Isles. 1916 Birth: Robert Strange McNamara, American businessman and politician, was United States Secretary of Defense from 1961 to 1968. He resigned that position to become President of the World Bank from 1968 to 1981. McNamara was born in San Francisco where his father was sales manager of a wholesale shoe firm...he entered the Army as a captain in early 1943, serving under Col. Curtis LeMay with analysis of US bombers' efficiency and effectiveness as a major responsibility. He left active duty three years later with the rank of lieutenant colonel. During this period, McNamara helped to plan the 1945 bombing of Tokyo. In 1946 McNamara joined Ford Motor Company, which he later said had been the result of a Life magazine article which reported how few college-educated managers there were at the then unprofitable company. He was one of ten former WW II officers known as the "Whiz Kids". Starting as manager of planning and financial analysis, he advanced rapidly through a series of top-level management positions, becoming on 9 November 1960 the first president of Ford from outside the family of Henry Ford, one day after President Kennedy's election. McNamara received substantial credit for Ford's expansion and success in the postwar period. President-elect John F. Kennedy first offered the post of secretary of defense to former secretary Robert A. Lovett. Lovett declined but recommended McNamara; Kennedy had him approached by Sargent Shriver (regarding either the Treasury or the Defense cabinet post), and less than five weeks after becoming president at Ford, McNamara accepted Kennedy's invitation to serve as Secretary of Defense. Although not especially knowledgeable about defense matters, McNamara immersed himself in the subject, learned quickly, and soon began to apply an "active role" management philosophy...Former Secretary of State Dean Acheson wrote, "Except for General Marshall I do not know of any department head who, during the half century I have observed government in Washington, has so profoundly enhanced the position, power and security of the United States..."
1918 WW1: The Noyon-Montidier offensive, a drive by the German army in northern France to threaten Paris, begins. 1928 Charles Kingsford-Smith and Charles Ulm become the first to fly across the Pacific when they land in Brisban after their flight from California. 1934 Birth: Donald Duck. Walt Disney's newest cartoon creation, the irascible Donald Duck, makes his first screen appearance in The Wise Little Hen. 1934 Diplomatic relations between Russia and Romania are resumed. 1934 The Sicherheitdienst (SD) is established as the political counterespionage arm of the NSDAP. 1935 Sixty Jews are injured in anti-Jewish riots at Grodno in Poland. 1936 Mussolini appoints Count Galeazzo Ciano Italian foreign minister. 1940 WW2: The German conquest of Norway is completed and the Allies withdraw their remaining troops. The King of Norway and his government order all Norwegian forces to cease fighting at midnight. 1941 WW2: At Churchill's suggestion, Lord John Simon meets with Rudolf Hess and pretends to negotiate Hess' peace proposal. In reality, Simon is only pumping Hess for information and has no authority to negotiate. Simon is accompanied by Ivone Kirkpatrick. 1942 WW2: The United States and Britain agree to pool all resources of food and production. 1942 WW2: Polish leader General Sikorski, in a London speech, warns that the Jews of Poland "are doomed to destruction in accordance with Nazi pronouncements on destroying all Jews regardless of the outcome of the war." 1943 The Secret Diary of Anti-Hitler Conspirator Ulrich von Hassel: (Ebenhausen) "This state (Germany) is developing more and more into an immoral and bankrupt concern, led by an irresponsible gambler, who can himself hardly be considered mentally normal and who is surrounded by rabble. And so we roll towards the bottomless pit. No field marshal acts as a higher concept of duty would prompt. Even if he had no such inkling, the bare interest of the soldiers in survival and the simple military principle of waging war should suffice." 1943 WW2: The US Congress authorizes legislation giving the green light to a payroll withholding tax. 1944 WW2: German troops recapture Tulle. Waffen-SS soldiers find the bodies of 62 dead German soldiers, 20 others were never accounted for. In view of the 'Sperrle Orders' (see March 2), the SS soldiers hang 99 suspected partisans from lampposts and balconies. 1954 Senate-Army Hearings: The demagogic Wisconsin Senator, Joseph R. McCarthy, is severely wounded by an attack leveled at him by Army counsel Joseph N. Welch, who poignantly inquires, "Have you no sense of decency, sir?" This is the begining of McCarthy's end. Moral: One can attack the State Department, or attack the Congress, but don't mess with the US Army. 1959 The first submarine with Polaris missiles, the USS George Washington, is launched. 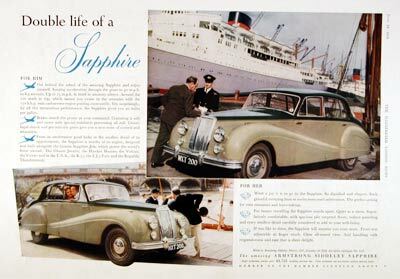 1960 Armstrong-Siddeley automobiles become extinct. 1969 The Senate confirms Warren Burger as chief justice of the United States, succeeding the controversial Earl Warren. 1975 Live radio broadcasting from the British House of Commons begins. 1977 The Silver jubilee of Britain's Queen Elizabeth II is celebrated with fireworks. 1978 Leaders of the Church of Jesus Christ of Latter-day Saints strike down a 148-year-old policy of excluding black men from the Mormon priesthood. 1978 A Gutenberg Bible, one of only 21 in existence, sells for $2.4 million, in London. 1984 An Italian prosecutor's report links the Bulgarian secret service to the 1981 assassination attempt on Pope John Paul II. Three Bulgarians are indicted but a trial will fail to prove the charges against them. 1985 American educator Thomas Sutherland is kidnapped in Lebanon; he will be released in November 1991 along with fellow hostage Terry Waite. 1986 The Rogers Commission releases its report on the Challenger disaster, criticizing NASA and rocket-builder Morton Thiokol for management problems leading to the explosion that claimed the lives of seven astronauts. 1991 Mount Pinatubo, a Philippines volcano that had been dormant for 600 years, erupts, causing the evacuation of US troops from Clark Field air base. 1992 More than 700 known Mafiosi are arrested in a new crackdown in southern Italy. 1993 Japanese Crown Prince Naruhito weds commoner Masako Owada in an elaborate Shinto religious ceremony. 1993 US officials admit that veterans of the Gulf War are suffering from a mystery illness. 1994 The US House of Representatives votes to require the Clinton administration to stop participating in the UN sponsored arms embargo against the Bosnian government. See Also: 1995, below. 1995 One week after being shot down over Bosnia by a Bosnian Serb missile, and a day after being rescued, US Air Force Captain Scott O'Grady is warmly welcomed by his comrades at Aviano Air Base in Italy. 1995 Japan's parliament passes a controversial resolution designed to atone for the country's role in WW2. 1996 China releases dissident Ren Wanding after seven years in jail following the 1989 democracy protests. 1997 The leading candidate to become chairman of the Joint Chiefs of Staff, Air Force General Joseph Ralston, withdraws from consideration after a past adulterous affair becomes public knowledge. known. 1997 The British lease on New Territories in Hong Kong expires. 1998 General Abdulsalam Abubakar is sworn in as Nigeria's new military ruler, one day after the death of General Sani Abacha, who'd seized power in a 1993 military coup. Abacha had died of an apparent heart attack at the age of 54. 1999 After 78 days of intense NATO airstrikes, Yugoslav and Western generals sign a pact clearing the way for a Kosovo peace plan. Yugoslavia pledges to withdraw all Serbian troops from Kosovo within 11 days. 1999 President Clinton instructs federal law agencies to collect race and gender data on people they stop or arrest, in a move to end racial profiling by police.